In 2010 it seems like you couldn't go a month or two without a new book on Airfix hitting the shelves. 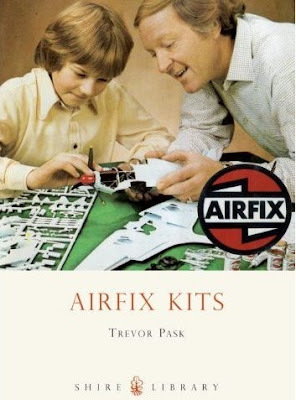 This little book is simply a short history of Airfix. While not nearly as detailed as the Ward books, it is much better edited. There are many pictures of built kits and box art with lots of images from Airfix catalogues of the past. While there are some mentions of other Airfix related lines, the book solely covers Airfix's plastic kits. Outside of the overly 70s cover...those are some dodgy haircuts...this is a really nice short history of the famous manufacturer. As AZ are trying to get as much out of the molds as possible, the kit has some odd quirks. For example the intake scoop of the Spitfire VI is molded on the fuselage. (The instructions do mention to remove this.) In addition, in the ongoing poor use of photo-etch in modern kits, the fuselage antenna is provided on the PE fret. Great. A flat piece of metal to represent a 3-D object. Also, the Seafire hook conversion is in PE which needs to be bent to create the hook. Again this if far from an ideal choice of material and not really much of a conversion. Two decal sheets are provided. One for stencils, and one for the two markings options. These include Duncan Hamilton's Royal Blue station hack and a standard aircraft from 885 Squadron in the Temperate Sea Scheme. Overall I'm a little disappointed in the kit. First off it was expensive, at $20. Also, while AZ has some interesting subjects their modelings just aren't top of the line. They remind me of MPM/Special Hobby kits of over a decade ago. That combined with the silly choice of materials and the half hearted Seafire conversion, make this a less then a great value. When all is said and done, I'll probably try to find some new propellor blades and build the kit as a high altitude Spitfire VI as operated by 417 Squadron. Within the last month there have been a couple of discussions on the Hyperscale Plane Talk forum about Spitfires and their flaps down on the ground. One poster went so far as to state "No flaps down, unless undergoing maintenance." I hate absolutes, so how about this pic of Spitfire L1090 visiting CFB Trenton on June 6, 1940? 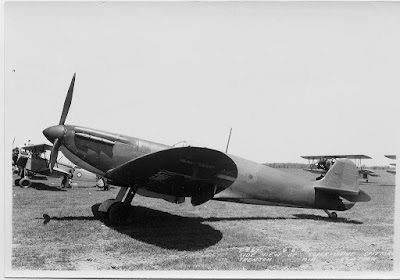 Modeler's Note: Spitfire L1090 was an very early Spitfire Mk.I and it has the early unarmoured windscreen and pole antenna, though it looks like it has the blown canopy. Right now only two 1/72 Spitfires Mk Is have the early windscreen included, the old, crude, and poorly shaped 1970s Hasegawa kit and some boxings of the recent short run AZ kit. 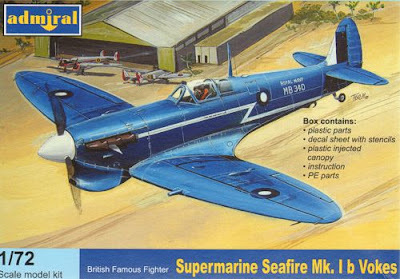 However, all is not lost, as Airfix will reissue their Mk. I later this year with the early canopy and spinner. Some of you may have heard that last month I appeared before the Ohio Supreme Court. I'm sure most of you just assumed it had something to do with my day job, but it was actually a modeling case. Keen observers may have noticed that Kentucky Law Pirate David Knights has been posting pictures and commentary on my recent build of the Airfix Sabre. You also might notice that in the most recent post he has let slip that an injunction was placed against him from talking about my modeling. 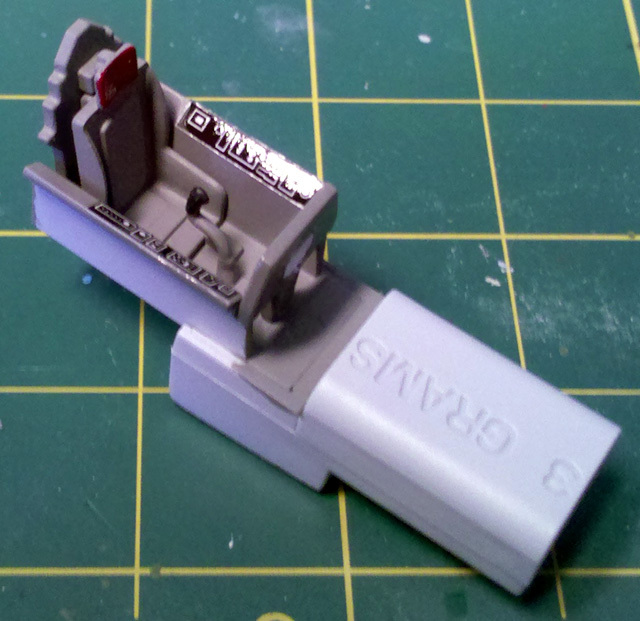 This case dates back to a post in which he referred to me as a "master modeler." Taken aback by this slander, I filed suit to have the post removed from his blog. Many attempts were made at a settlement, but it quickly worked its way up the court system and ended up before the Supreme Court. Thankfully I have prevailed in this case and Mr. Knights can never use the term "master modeler" with regard to my work, nor me as a modeler. But all is not lost for poor David...he may still use terms like "hack," "half assed assembly and painting job," and "a third grader could do better." Oh, the Airfix Sabre? It is going together pretty well and I've really been enjoying it. Well until Sunday, when I dropped it. No damage was caused to the model, but one of the nose weights broke loose. 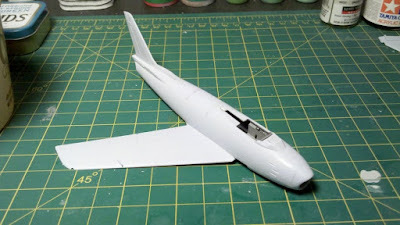 So I decided to pour some super glue into the fuselage to secure it. Good idea, other then the Sabre is basically a tube and the glue decided to pour out of both ends. And just as I was ready for primer. Oh well, I'll break out the sanding sticks and hopefully remove all the CA. And, of course, even with super glue pouring from both ends...it didn't secure the nose weight and the model still rattles. Sabre maraca anyone? So I see on Hyperscale the other day that another new UK based modeling magazine will soon enter the market. I gotta say that I thought the market was saturated a few years ago and since then there have been at least two or three new entires. How can they all stay afloat? Wasn't the internet supposed to kill the paper magazine, not cause them to breed like bunnies? 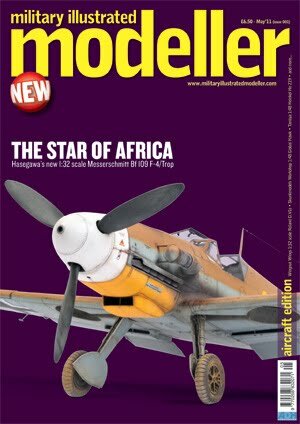 Anyway, this new magazine is Military Illustrated Modeller and will alternate between aircraft issues and armor issues. (Neat idea.) It will be edited by Brett Green and Marcus Nicholls and looks to be courting the high end of the market both with production values and content. (It kind of reminds me of the nice, but pricey, Air magazine.) They are certainly catering to a different market then the new Airfix magazine! What I don't get, is outside of it alternating aircraft and armor, how is it much different from the publishing house's current Model Aircraft International magazine? What new does it bring to the table? The first issue...an aircraft edition...will have a MiG-21 build and I'm a fan of Brett Green's work so I'll probably pick it up and report back. After many years, the story can finally be told. Enjoy. Modeler's Note: When it comes to the MiG-21F in 1/72 really the only option is the Revell AG kit. 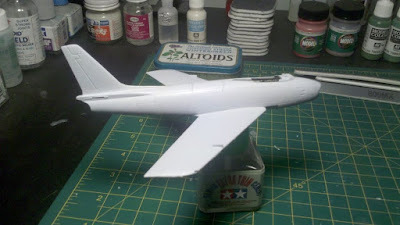 Thankfully it is excellent and the easiest way to build a CF-121 Redhawk.